In the last week, MOMS has encouraged Villa supporters to voice their concerns about the sensationalist and irresponsible comments made by the BBC MOTD’s live commentary team of Jonathan Pearce and Mark Lawrenson. Thanks to all who have taken the time to send their views to the BBC via their complaints form. The amount of Villans who have taken a stand has been impressive. Thanks for getting in touch with us about the Aston Villa v West Bromwich Albion match on FA Cup Match of the Day. We appreciate that football is subjective and that fans hold a hugely diverse range of opinions, especially during a tense local derby such as this. In this case, Mark Lawrenson and Jonathan Pearce were simply expressing their own views on what they could see at the moment in time. As the incident was unfolding, Mark expressed his criticism for those who ran onto the pitch, but shortly after he pointed out that the majority of the Villa fans who remained in the stands were booing the fans on the pitch as they felt they were ruining the win for everyone else. Mark and Jonathan didn’t state that those on the pitch were only Villa fans, they simply expressed their concerns as the pitch invasion occurred when the game was still in play meaning the referee could still have abandoned the game. We’re sorry to learn that you’re unhappy with the commentary and we can assure you that our Football production teams are aware of the issues that have been raised. What this standard letter doesn’t take into account is that most fans complained about the comments made on the final whistle (see our Media Muppets article for quotes), also they have failed to address the Tweet BBC MOTD had made about pitch invasions, that several fans mentioned in their complaint forms. Also, these replies are before the hypocrisy that viewers of the Reading vs Bradford game witnessed, when Reading’s pitch invasion was described as “lovely scenes”. If you haven’t sent in a complaint yet, it’s worth using this hypocrisy as your main example – we’ve gone into more detail in this Media Muppets article. It’ll be interesting to read what standard reply the BBC come up with for this. Below is another BBC Complaint reply to a Villa fan, who has obviously centred what he said on the BBC’s news coverage, the part the BBC played in the kick-off time and also the fact the WBA fan’s vandalism had gone unreported while Villa fans were vilified. While, it’s full of niceties, interestingly, the BBC’s reply does pass the buck to the FA on the time slot and like the other reply, stresses that issues from complaints are passed on to the relevant department. I was sorry to read you have been unhappy with BBC News of late. I understand you feel our coverage of Aston Villa’s FA Cup victory over West Brom on March 7 has been impartial. 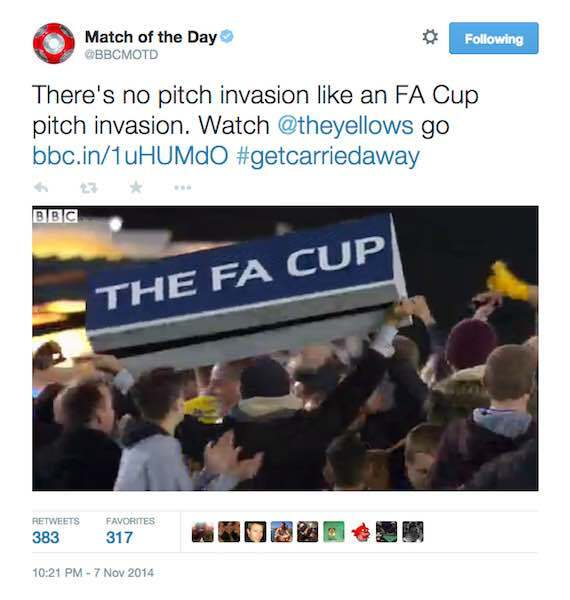 I further appreciate you believe the BBC must take a share of the responsibility for the subsequent pitch invasion due to the scheduling of the game’s kick-off time. To address your concerns; it is not always possible or practical to reflect all the different opinions on a subject within individual bulletins or programmes. We seek to ensure that over a reasonable period, all sides of any public debate are explored and explained, so listeners can be better informed in coming to their own judgment of an issue. The BBC does not seek to denigrate any view, nor to promote any view. It seeks rather to identify all significant views, and to test them rigorously and fairly on behalf of the audience. The behaviour of the travelling West Brom support has been highlighted throughout our coverage. As the FA has launched an investigation into the behaviour of both sets of fans, we believe our level of coverage has been fair and appropriate. Whilst I appreciate your concerns in regard to kick-off times, broadcasters are offered dates and times for the matches from which they can chose. We are sorry to learn that you are unhappy with the situation, however ultimate responsibility for the dates and times which are made available to broadcasters for all the matches rests with the FA as the sport’s governing body. Rest assured, we do value your feedback. All complaints are sent to senior management and I included your points in this overnight report. These reports are among the most widely read sources of feedback in the BBC and ensures that your concerns have been seen by the right people quickly. This helps inform their decisions about current and future programmes. Once again, many thanks for contacting us. People often complain about supporters not having a voice, but by acting together we can have, or at the very least, make some waves. I pointed out the happy children and family selfies being taken on the Villa pitch. Here is the INSIPID BBC reply. As KW commentating on 66 world cup final ‘ SOME PEOPLE ARE ON THE PITCH..THEY THINK ITS ALL OVER…IT IS NOW !!! BBC biased commentators and out of touch. Basically , visually illiterate. We appreciate that football is subjective and that fans will hold a hugely diverse range of opinions, especially during a tense local derby such as this. In this case, Mark Lawrenson and Jonathan Pearce were simply expressing their own views on what they could see at that moment in time. As the incident was unfolding, Mark expressed his criticism for those who ran onto the pitch, but shortly after he pointed out that the majority of the Villa fans who remained in the stands were booing the fans on the pitch as they felt they were ruining the win for everyone else. Mark and Jonathan didn’t state that those on the pitch were only Villa fans, they simply expressed their concerns as the pitch invasion occurred when the game was still in play meaning the referee could still have abandoned the game. I await my generic reply. I will pursue it if I get the same response. I have plenty of better things to do but sometimes you need to make a point. I just had exactly the same response. Someone is obviously busy with copy and paste as I received it within 30 minutes of sending my complaint. It doesn’t look like we will get any further redress, although your comment above “Maybe that was all our influence?” seems to be spot on. I had the exact same reply, so it is clearly standard. The wording of my complaint is below, which they have kind of replied to in broad terms, but missed finer details (and the only specific question) using their standard reply. I partly think rejecting their reply would be fun, but I am too busy to bother. However I think more fans should complain, as the noise will get noticed and will change their approach. Up the Villa. The reporting of Aston Villa fans behaviour during the game was sensationalist, over the top, used emotive words and phrases designed only to condemn, not understand. It was also inconsistent with previous BBC and Match of the Day responses to similar incidents, particularly by so called ‘smaller clubs’. The commentators have a responsiblity when broadcasting live as they effectively ‘set the narrative’ for subsequent reporting, and likening the events to hooliganism from the 1980’s was just plain wrong. I am not condoning the pitch invasions, and especially the one whilst the game was ongoing, but it is clear on reflection that some fans thought the final whistle had gone (see Lowton’s arms raised). However, the reaction of being sensationalist and making cheap gags (a lot of villages are missing their idiots) was not the correct response. I must also point out at this stage the obvious link to Kenneth Wolstenholmes classic commentary of “some people are on the pitch…etc”, which the BBC used as the title for a show a few years ago. Can someone explain the difference where one is now celebrated but the other is so condemned? The lack of comment on other fans throwing seats at fans both during and after the game should also be addressed, as this is clearly inconsistent reporting. However, I will mention Gary Lineker’s balanced comments at the end, which show that someone doing their job properly can react appropriately ‘live’. Have you lot not got anything better to do? What do you actually think writing in to these people will do? Do you actually think they are bothered by your letters? Villa are going to Wembley. Lets get on the pitch there too! It’s to change what happens in the future and make them wary of what they say. You’d have noticed a change already in how they commentated on the Reading pitch invasion…the commentators didn’t comment! They left it to Lineker. Being apathetic and doing/saying nothing, means the same mistakes will be made again and again. Standard PC Bullsh** from the BBC, from people who basically don’t know what they are talking about. Just like a bunch of Politicians !! Cool heads were needed in the commentary and the BBC failed except for Linekar who saw it was celebration. It’s not a return to the 80s and the BBC lied. Where is all the carnage – I’ve seen 2seats thrown on you tube – Villa fans running to celebrate before being tripped over in a aggressive way by an Albion player and others shoulder barged when they were not a threat. One fire extinguisher let off. That’s it – Delph was celebrating and not being eaten. Why did the BBC film a guy swinging on a goal – sensationalise – and then quickly to happy euphoric fans. They got it wrong and the club and fans should challenge the BBC about this.